I had heard of Dark Matter and Dark Energy before but I hadn’t known all of this— It’s pretty astounding. The latest episode concerning Dark Matter—the part where humans first became aware of it—begins with an ironic twist. Back in the 1960’s there was an astronomer, Vera Rubin, who had 2 small children. This was a period when women were barely allowed to have careers at all and, if you had children, your career had better take a back seat. She could be certain that, if she undertook a study of something like Black Holes [the sexiest things astronomers were looking at at the time] for instance, her male colleagues would publish their findings before she could catch up. So she decided to study something no one else was interested in. Was she in for a shock or what? Partly because no one else was looking and partly because she was fascinated by how galaxies work, she decided to investigate them. She looked at the closest one to us, Andromeda, first. She expected the stars orbiting the edges of the galaxy to act the way our planets do as they orbit our sun. The amount of sway gravity has over each planet determines its speed. The further away the planets are from Sol, the slower their orbits. Basic Newtonian physics. But that’s not the way stars in a galaxy work—as she discovered when she trained her telescope on galaxy after galaxy after galaxy. The stars orbit at the same velocity no matter where, in the galaxy, they are. Surprise all round. So, Rubin postulated, there must be more mass [and, therefore, more gravity] within galaxies than the atoms [the black holes and the star clusters] at the center of each one would suggest. Also, that gravity must be spread fairly evenly throughout the galaxy rather than being concentrated at the center. She labeled this gravity-producing substance Dark Matter—since we can’t see it or detect it through any direct means. The only way we know it is there is by it’s influence on the matter we can detect. Furthermore, approximately 90% of the matter in every galaxy she looked at seemed to be this Dark Matter. In other words, until that time, astronomers had been studying the tip of the iceberg that makes up our universe. Who knew? Suddenly the field of study she had undertaken because no one else would be interested was chock full of other people either trying to prove her measurements and theories incorrect or scrambling to explain them. Out of the blue, Dark Matter was a hot topic. She has received the Dickson Medal for Science, the National Medal of Science, the Gold Medal of the Royal Astronomical Society, the Gruber Cosmology Prize, the Bruce Medal and the James Craig Watson Medal. So much for tucking herself into a backwater niche in her field. Carlos Frank, a cosmologist in England, followed up on her theory using Newtonian Law. He fed his computations into a super-computer and discovered something astonishing. When he fed all the calculations into a program that simulates the earliest universe as science understood it prior to Rubin’s work, the universe fails. A galaxy forms, the largest stars become super-novae and explode ripping the fabric of space apart. There simply isn’t enough gravity present to create the cohesive universe that we know. It certainly wouldn’t have survived long enough to allow life to evolve. It simply would not have. So Frank began introducing Dark Matter into the infant universe he had created within the computer. First a little, then more, until he had added five times as much Dark Matter as the matter we can see. Finally, his universe created galaxies like the ones we find all around us. According to his calculations it would have taken about 10 billion years for the first stable galaxies to form and the basic spiral shape we’re all so familiar with would be the norm. 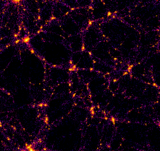 The universe includes 5 times as much Dark Matter as it does atoms. Richard Massey in Edinburgh, Scotland, looked for Dark Matter using Gravitational Lensing. It builds on Einstein’s theory that gravity bends lig ht. Massey postulated that Dark Matter, since it exhibits gravity, should bend light just as stars and galaxies do. So he set out to map dark matter using the bending of light waves to demonstrate its presence. Lo and behold—wherever he found evidence of dark matter through the verification of bent light he found galaxies. Overlay a map of Light Matter [the kind we can see] and his map of Dark Matter clumps and you find galaxies on a one-to-one correlation. Dark Matter is the skeleton of the universe. The Big Bang is still rushing onward. Science had expected it to be slowing down but, instead, it is accelerating. They’ve named this phenomenon Dark Energy and they’re using something they, so far, understand very little about—Dark Matter—to study Dark Energy, something they know virtually nothing about. While the amount of Dark Matter in the universe seems to encompass about five times more matter than the matter we can directly detect, Dark Energy seems to be far greater in scope than either one. The latest calculations indicate that about 5% of the universe is visible to us, about 25% is Dark Matter and fully 70% is made up of Dark Energy. Remember the post on the Genesis Story? Were these phenomena what the All that Is needed to include in order to create a universe that was not, by its nature, chaos? Or, just like the rest of its creation, are these forces conscious of themselves at some level? Are they, too, part of the dream the All that Is dreamed? Whenever someone poses atheism to me, I ask them how confident they are in the current ability of science to explain everything about the universe. 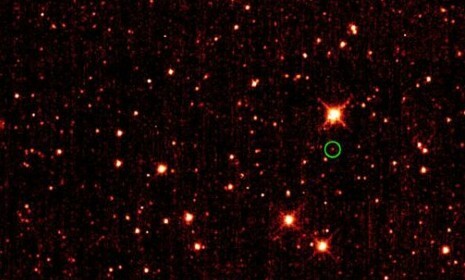 We really aren’t that advanced yet if you think about it, we just recently managed to get something out of our solar system, and just landed a controlled robot on our closest planet. To say that we understand enough about the universe to deny a supremely intelligent agent that is so far above us that our brains can’t physically handle it that has existed since far before our current universe, well, is just silly. They say sufficiently advanced technology would look like magic to us, but what about an entity like that? 70% of the universe is something we have absolutely no idea about, which indicates a lot of what allows us to exist is going on behind the scenes. I think the dark energy is the other dimensions interacting with our physical one, the astral, causal, etc. yes, David. this sort of thing just makes me more sure of SOMETHING beyond us or nature or whatever you want to call it. the universe just keeps serving up surprises – and whose to say there’s not some self-aware agent beyond it all? to me, agnosticism makes much more sense than atheism. at least, then, there’s an open mind at work. and, I have to admit, agnosticism does come into play for me every so often. then I look at the world around me and everything Michael is saying is playing out right in front of me – and all the doubt evaporates. and as to this post – I’m just enthralled by any and everything the astronomers and the quantum physicists tell us. the parts I can understand, at least. the rest I take on faith – much more so than anything Michael says. after all, as I said, I see what Michael is telling us all around me every day. faith doesn’t enter into that.